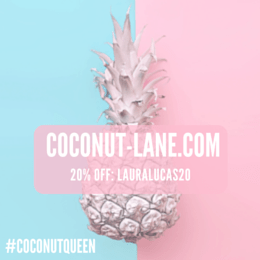 If, like me, you can easily spend hours on Pinterest and Instagram, finding delicious new recipes and inspiration for your next healthy meal, then I’m sure you will have seen Açai Bowls many times. 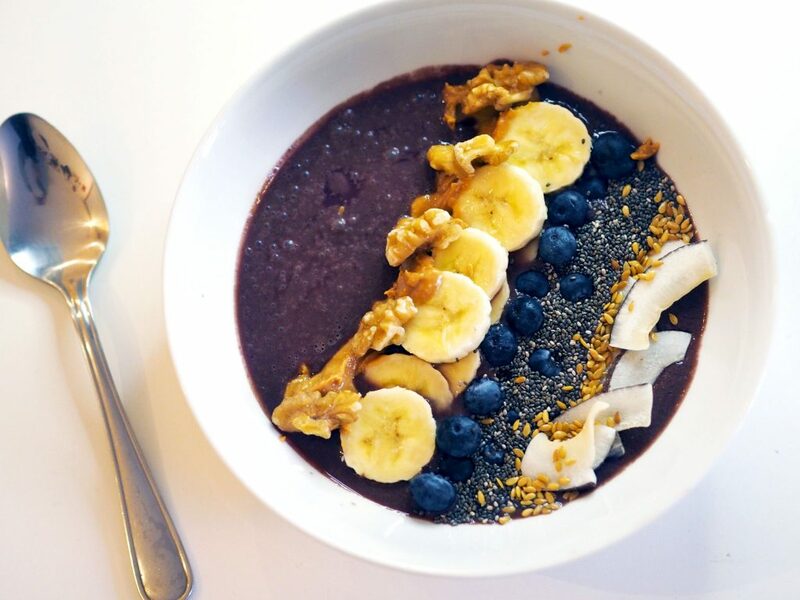 These popped up in my feeds last year, and I just couldn’t get enough of people’s brightly coloured and incredible looking Açai Bowl creations. Obviously I just had to try this new food trend, but, as with many amazing foods I need in my life, they seemed to be quite a rarity here in the UK. 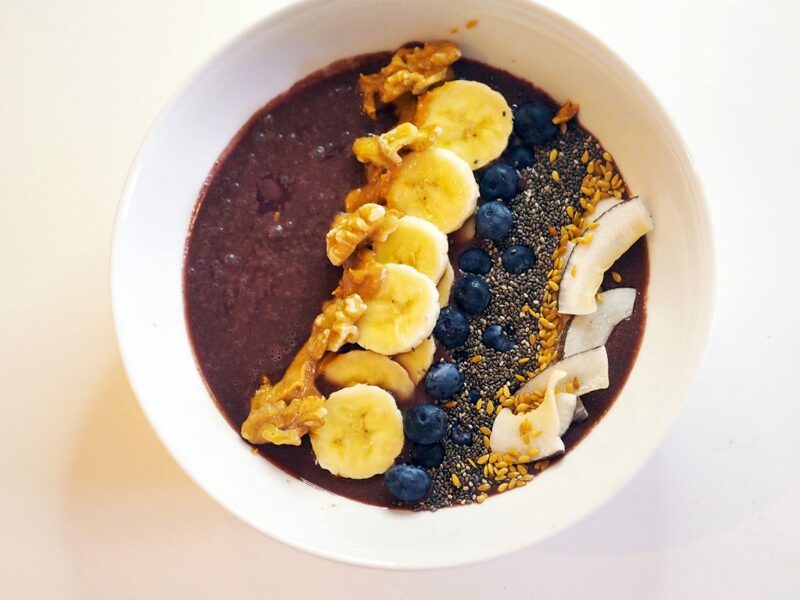 An Açai Bowl is basically a really thick smoothie with an almost ice cream-like texture, containing the amazing superfood – açai berries. It is served in a bowl and finished with an array of amazing toppings such as fruit, nut butter, oatmeal, nuts and seeds. After drooling on my phone screen over other people’s breakfasts for over a year, I was super excited to find the Sambazon smoothie blend in my local supermarket, meaning I could finally make my own dessert-like creation for breakfast and get in on this delicious trend (after I had Instagrammed it, of course). 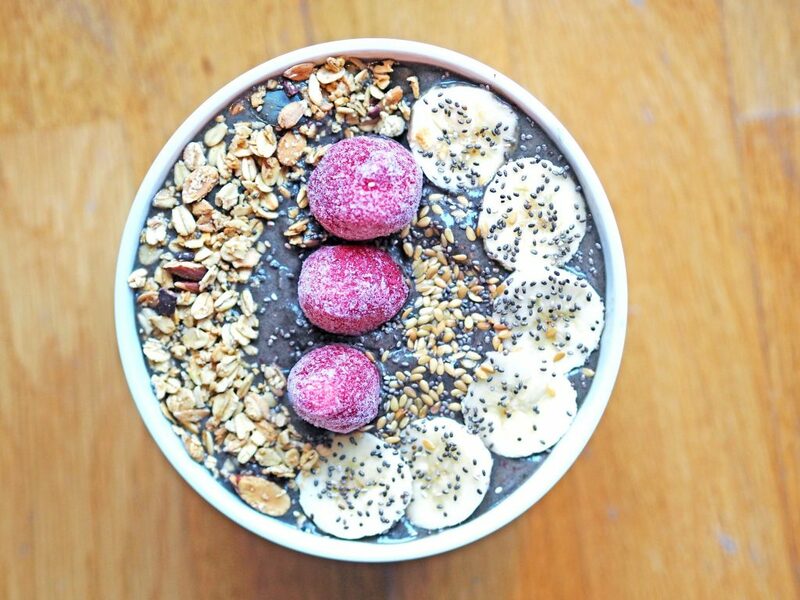 I have found that the secret to the perfect Açai Bowl, is getting the right consistency from the blend. The packets can be used to just whip up a smoothie, but to get the creamy texture you will need less liquid, maybe some extra frozen fruit, and a banana or some coconut or almost milk to give it a nice creaminess. I then topped mine with some of my favourite toppings, but of course you can have yours however you like. 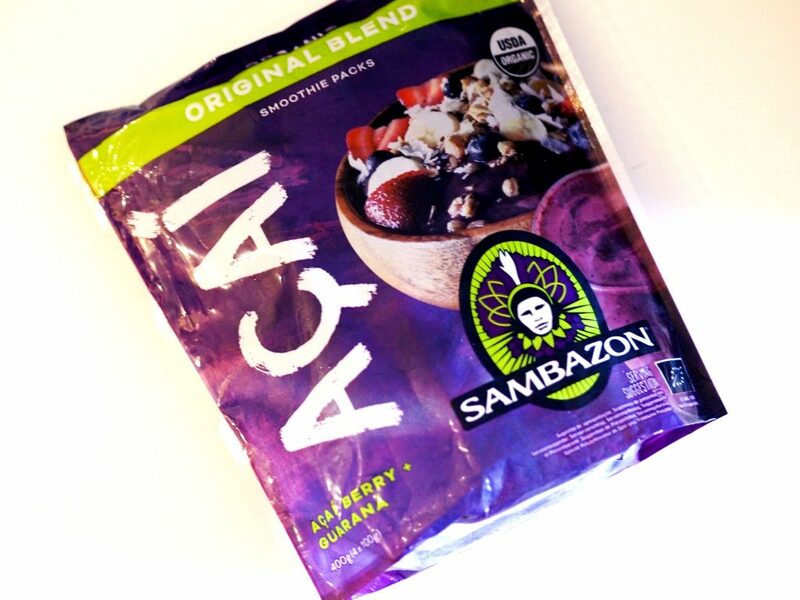 The great thing about these is that once you have these ready-to-go açai puree packs, you can experiment and try out different combinations and toppings to create your perfect bowl. 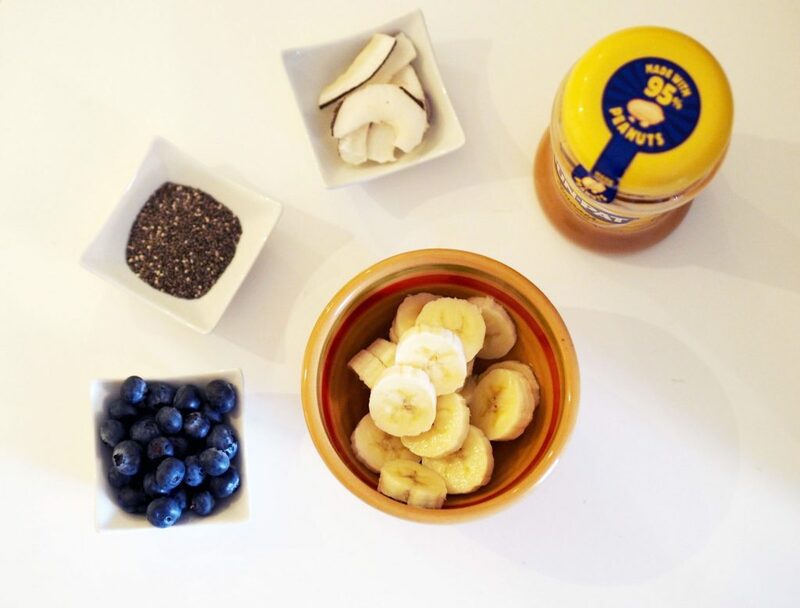 For this bowl I added banana, blueberries, chia seeds, coconut and some peanut butter. I love mine for breakfast, but they are also a perfect dessert as the creaminess and sweetness really satisfies my sweet tooth. 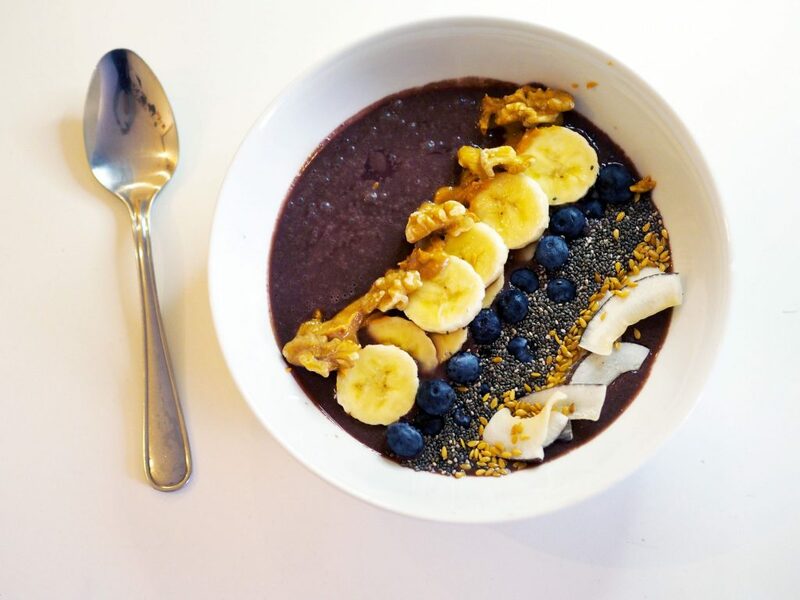 The flavour of açai is delicious, but I also find it works well as a combination with so many other flavours; so whether you want fruity, nutty, chocolatey, or maybe just a good old bowl of plain açai berry – this is such a great way of getting the superfood and all of it’s health benefits into your diet. I found my Sambazon packs at Tesco, but you can buy them online from Amazon too if they are available in your country. Let me know if you try out these delicious bowls!